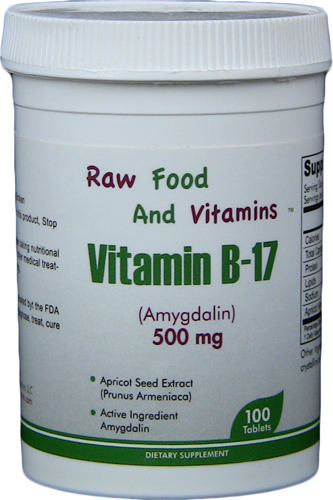 The 500 mg tables are an extraction of the vitamin B17 only and comes from the raw apricot seed. It is taken out of the whole food, the apricot seed, and put into tablet form for the purpose of curing cancer. As talked about before, the 100 mg tablet is for preventing and the 500 mg tablet is for people who cannot do the injectable (which is the best form) or the seeds. You can do both together, seeds and 500 mg tablets. The difference is you have to start out slow at low doses at different times of the day and just keep increasing. It gives you the whole food and gives you as much B17 as you can put in the 500 mg tablets. The 500 mg tablets and the seeds go through the digestive system. That is why you have to start out at a low dose. Now, if you have cancer there are other things you have to do, in my opinion, and that is discussed under other product information. There are Super Prevention Packs and other items on the site you can and should utilize, but the 500 mg tablets are to get a high volume of B17 into your system all at one time if you cannot do the injectable. Some people take this size tablet for prevention as well. Consumption varies depending on the situation. The range is from 1 to 18 tablets daily. A bottle contains 100 tablets.